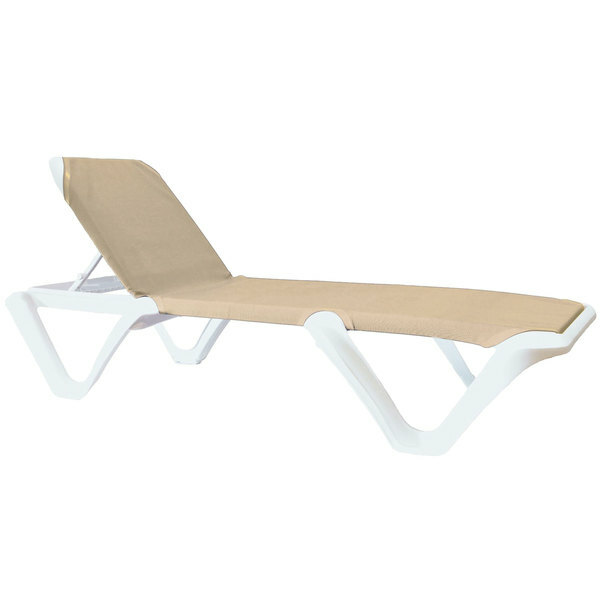 Provide your guests with a place to kick back and relax with this Grosfillex 99904004 / US894004 Nautical Pro white chaise lounge with sling seat! Made of a sturdy, long-lasting resin material, this chaise lounge offers superior strength without the hefty weight that comes with comparable outdoor lounges. Its comfortable sling seat is made of vinyl-coated polyester fabric for extra support and durability while also preventing sagging after extended use. It's also UV resistant, ensuring that its attractive khaki color won't fade when exposed to direct sunlight. Thanks to its breathable fabric, this chaise dries quickly after becoming wet from rain or a power-washer cleaning. A great addition to pool areas, beaches, and spas, this luxurious chaise lounge is the perfect place for your guests to lie down and relax. Its adjustable design allows guests to move the back to best fit their needs and comfort levels, while its legs are capped with nylon glides to provide extra resistance when placed on rough floor surfaces. Boasting an ample 300 lb. capacity, this chaise lounge guarantees comfort as your guests recline and unwind on your outdoor deck or patio!